When our country was established, some Americans already opposed the practice of slavery. However, many thought that it would soon die out on its own, because it was too expensive to purchase and care for slaves. As the United States grew in the early 19th century, the country expanded west and south. The North developed by establishing factories, and the West was being settled mainly by small farmers. Slavery had been outlawed in these areas with little trouble. The South, however, was establishing large plantations to grow rice, tobacco, and most importantly, cotton. Many workers were required to grow these crops, so the plantation owners used slaves a farm laborers. Southerners soon felt that their way of life could not exist without slavery. Before becoming a state in 1816, Indiana was part of the Northwest Territory. Slavery was forbidden in this area by the Ordinance of 1787. Ohio and Illinois were also part of this area, so slavery was outlawed in those states also. However, slavery was legal in Kentucky and other states south of the Ohio River. The Underground Railroad was neither a railroad nor was it located underground. Instead, it was the name given to a very loosely organized network of escape routes used by runaway slaves to reach freedom. These routes intertwined throughout the North and lead ultimately to Canada. It was never formally organized on a wide scale. Instead, it developed in various areas where peole felt slavery was wrong. Both black and white people participated in this effort to help runaway slaves escape. The houses that were safe places for runaway slaves were called stations. People who helped the slaves escape were called conductors. They would conceal the slaves, keep track of the slave hunters who came looking for them and help the runaways on the next leg of their journey. Slaves learned about the escape routes from quiet talk or secret songs of other slaves. They could sing songs that contained secret messages in front of the slave owners. The slave owners thought that the slaves were just singing religious songs but the words had different meanings. One such song is "Swing Low Sweet Chariot." In that song, "home" means a life of freedom, and "chariot" means the Underground Railroad. Federal laws allowed slave hunters to recapture slaves even in states where slavery was illegal. The Underground Railroad developed to help runaways who were able to escape and come north, but who needed to reach Canada in order to be free. Underground Railroad stations could be found in many communities, including Indianapolis, Madison, Richmond, Evansville, and Newport. Many slaves crossed the Ohio River at Cincinnati, Jeffersonville, or Madison. Underground Railroad routes led from all three of these places to Newport. Slaves used many different methods of traveling in order to escape to freedom. Some hid in false-bottom wagons driven by a friend, while others used carriages or saddle horses. A few disguised themselves and rode on railroad trains or ships. However, a majority of slaves probably walked most of the way. Back roads or trails were used to confuse pursuers and to make the routes irregular and hard to follow. Safety was more important than speed. Aiding the runaway slaves was dangerous work, since it could result in a fine or even a prison term. As a result, those who helped were careful not to leave written records. Often, runaway slaves would hide during the day and travel 15 to 20 miles at night. This made the journey especially long for those who were traveling hundreds of miles to freedom. Throughout the early 19th century, the issue of slavery became more and more divisive for Americans. Those who favored doing away with slavery were called "abolitionists." Included in their ranks were people from many different social and religious groups. Members of the Quaker religion were particularly likely to be abolitionists, because the practice of slavery went against their religious beliefs. 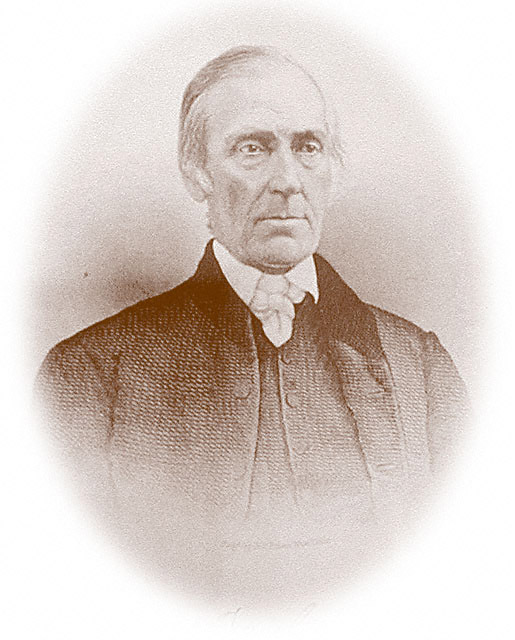 Levi Coffin was born in Guilford County, North Carolina in 1798, and married Catharine White in 1824. They were members of the Quaker religion. Like many other Quakers, the Coffins found it more and more uncomfortable to live in a slave state like North Carolina. At this time, many Quakers were moving west to the frontier areas of Indiana and Ohio, both to escape the influence of slavery and to obtain better farmland. Levi Coffin's parents and other family members had joined this migration, moving to Indiana in 1825. Levi, Catharine, and their young son followed them a year later. The Coffins moved to Newport, Indiana (the name of the community was changed to Fountain City in 1878). Newport is near the Ohio/Indiana border nearly due east of Indianapolis. When the Coffins arrived there they found that many escaped slaves passed through the community trying to reach Canada. There was a community of free blacks in the area who tried to aid these runaways. However, most other Quakers in the area were afraid to help, because it was against the law. Levi said that it was always safe to do what was right, and he and Catharine felt that it was right to help the escaped slaves. He let others know that they would help any slave who reached them. Even though they were breaking the law, they felt that the moral issue outweighed the Federal laws then in effect. They used Indiana laws on search warrants and illegal seizure to defy slave hunters. Their example gave courage to some other members of the community, who helped them in in their work. Levi Coffin had established a general store shortly after arriving in Newport, and it became very successful. Later, he realized that another way for him to protest slavery was to feature Free Labor Goods at his store. Free Labor Goods are items make with non-slave labor. He worked with other abolitionist groups in New York and Philadelphia to locate Free Labor Goods which they could sell also. In 1847, other Quakers persuaded the Coffins to move to Cincinnati to establish a wholesale business for Free Labor Goods. When runaway slaves reached Levi Coffin's door, he hid them so that they were safe from the slave hunters who might come looking for them. He then helped them moved along on the next leg of their trip to Canada. If it seemed safe, and if the slaves were healthy, they would continue on their trip as soon as possible. If they were weak or sick, however, or if slave hunters were in the area, Levi might keep them hidden in Newport for days or weeks. Before long, he was able to get other people in the community to help him. A local doctor would tend to any who were sick or injured. Catharine and some of the women in town formed a sewing group, and made new clothes for the runaways. Other people contributed money to provide shoes or other necessities. Levi also helped to organized anti-slavery societies to spread the abolitionist movement. Levi also helped the Black people living in Randolph County by helping to establish and support a school for them and their children. In 1844, Levi Coffin and another Abolitionist, William Beard, visited Canada to see how the freed slaves were doing and to have reunions with the former slaves. Ten years later, Levi and Catharine went together to visit the freed slaves in Canada. During the twenty years they were in Newport, they helped over 2,000 runaway slaves escape. In Cincinnati, the Coffins helped over 1,000 more slaves escape. He continued to work against slavery until the Civil War, when the Emancipation Proclamation and the 13th Amendment to the Constitution ended slavery in the United States forever. According to Levi Coffin's autobiography, one of the slaves who stayed in the Coffins' house had fled from Kentucky with a baby in her arms. Since it was winter, she crossed the Ohio River by jumping from one ice sheet to another, barely escaping drowning. This woman, Eliza Harris, was the model for the character, "Eliza" in Harriet Beecher Stowe's book, Uncle Tom's Cabin. 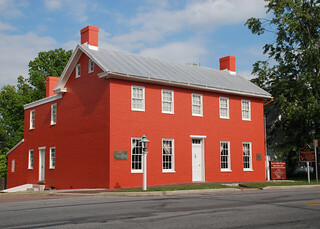 The Federal style brick home was built in 1839 with the expectation that it would be the Coffins' permanent home. It is the only building still standing which was used or lived in by the Coffins. It was built by workers without the assistance of an architect. The bricks probably came from a brickyard close to the house and the yellow poplar likely came from trees on the land owned by the Coffins. It was built with simplicity for a successful Quaker family. Although it is not spacious, it was well constructed. Runaway slaves would enter through the north door in the dining room. Their arrival was announced by a soft knock and after they were identified and taken in, the curtains were drawn and the candles were lighted. The largest group of runaway slaves which the Coffins ever housed at one time numbered 17. After moving to Newport in September of 1826, the Coffins lived in several different homes before having this house constructed in 1839. They moved to Cincinnati in 1847, but kept the Newport house because they planned on returning after about five years. They finally sold the house in 1860, after they decided to remain in Cincinnati. Over the next fifty years, the house was owned by several different people. In 1910, a frame addition was added to the rear and the building was operated as a boarding house. The home remained in the Rupe family for several decades. Nola Rupe Brittain recognized the historical significance of the home, and is credited with doing much to preserve it. The home was purchased from her estate by the State of Indiana in 1967 through the interest of Governor Roger D. Branigan, and leased to the Wayne County Historical Society. In 1969, the Levi Coffin Association was established to operate the building as a house museum. The home is now furnished with items typical of a Quaker household of the of the 1840's. 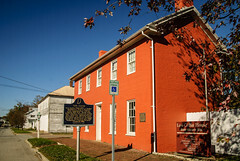 The Levi Coffin House was designated a National Historic Landmark in 1965 because of its significance as a symbol of the anti-slavery movement.